The UKF8001 filter is one of our most popular filters. It fits a variety of refrigerator models including Maytag, Whirlpool, Amana, Kenmore, Kitchenaid and more. 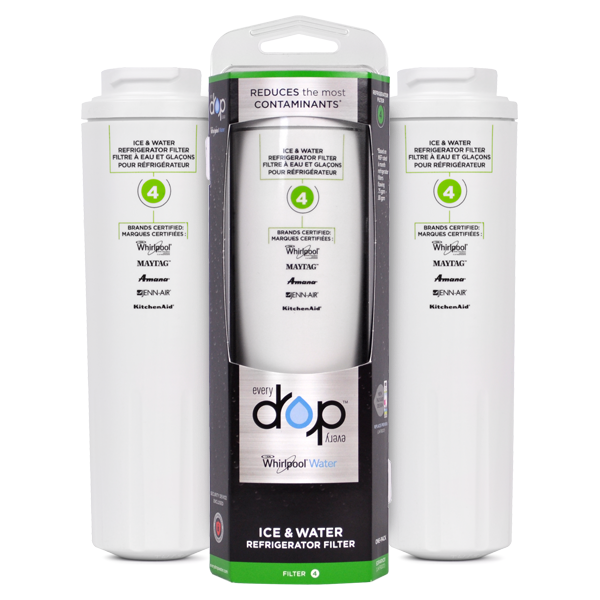 The Whirlpool UKF8001 filter and it's less expensive replacements (ClearChoice CLCH101) will reduce contaminants in your drinking water providing you with cleaner, better tasting water, and ice from your fridge. There are many alternate names for the UKF8001 filter which are listed in the table below. Search for your fridge filter to see if the ukf8001 filter is compatible with your fridge. Once you've purchased your new discount fridge filter, you will receive a filter change reminder email so you won't have to worry about forgetting to replace your filter. We'll do the work for you! The UKF8001 filter is easy to install and operate and should be replaced every six months to keep your water tasting good. Replacements for this include the OEM whirlpool EDR4RXD1, 469992, Filter 4, EFF-6007A and more are listed below. Be sure to replace your fridge filter every six months or sooner depending on usage. Check out installation instructions and product comparisons below. Enjoy free shipping and returns on all discount refrigerator water filters! Please note, the ClearChoice CLCH101 UKF8001 filter is made in Greenwood, Indiana, not shipped in from China. The UKF8001 is going to make your water cleaner, taste better, and remove any unwanted odors. Think of all the bacteria and particulates that are swimming in our everyday drinking water. All of that is mitigated by using one of our affordable water filters. So buy with confidence as our filters are just as powerful or better than the OEM versions. Just look below at our specifications section and see why our water filters should be your next purchase. 158 compatible alternative filter models below. Marvel at the specifications of our UKF8001 compatible filters. Discount Filters carries two brands of the UKF8001 Filter. The ClearChoice CLCH101 and the Factory Original Whirlpool EDR4RXD1. Both of these filters are compatible and excellent at reducing and removing contaminants like dirt, chlorine, chemicals, and minerals found in your water supply. The OEM Whirlpool EDR4RXD1 replacement filter has been tested and certified to meet both NSF/ANSI Standard 42 and Standard 53. This means that the filter has been put through scrutinous tests to confirm that it indeed reduces chlorine and removes other unwanted impurities in your water. 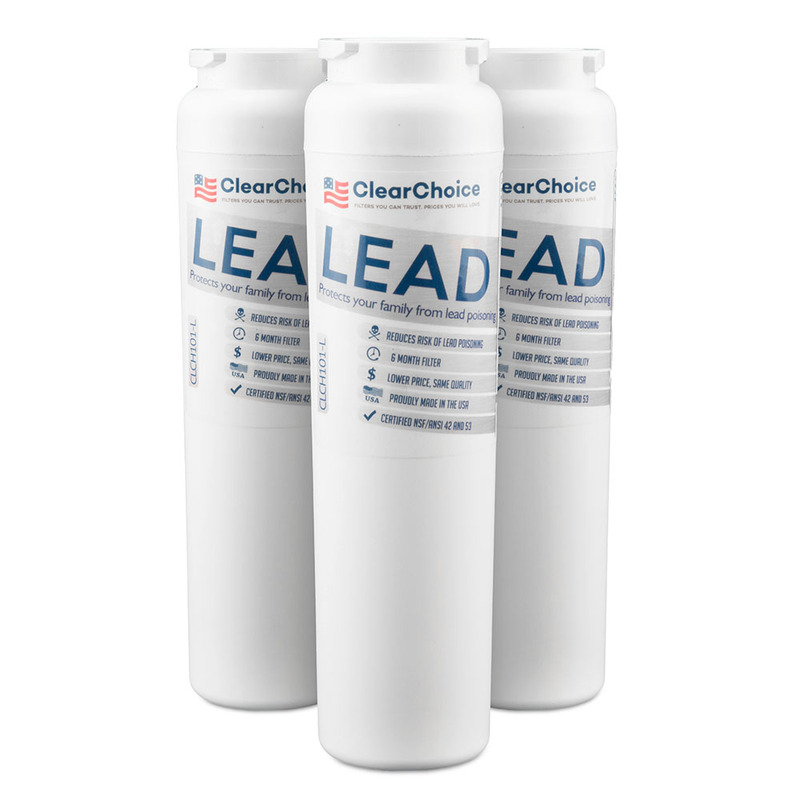 The ClearChoice replacement has very similar characteristics to the OEM, like filtering capacity, but it comes in at a much lower price. The primary difference between the OEM and the aftermarket filter is the price and NSF/ANSI Standard certifications, though some non-NSF/ANSI rated filters are still constructed from NSF/ANSI rated parts. 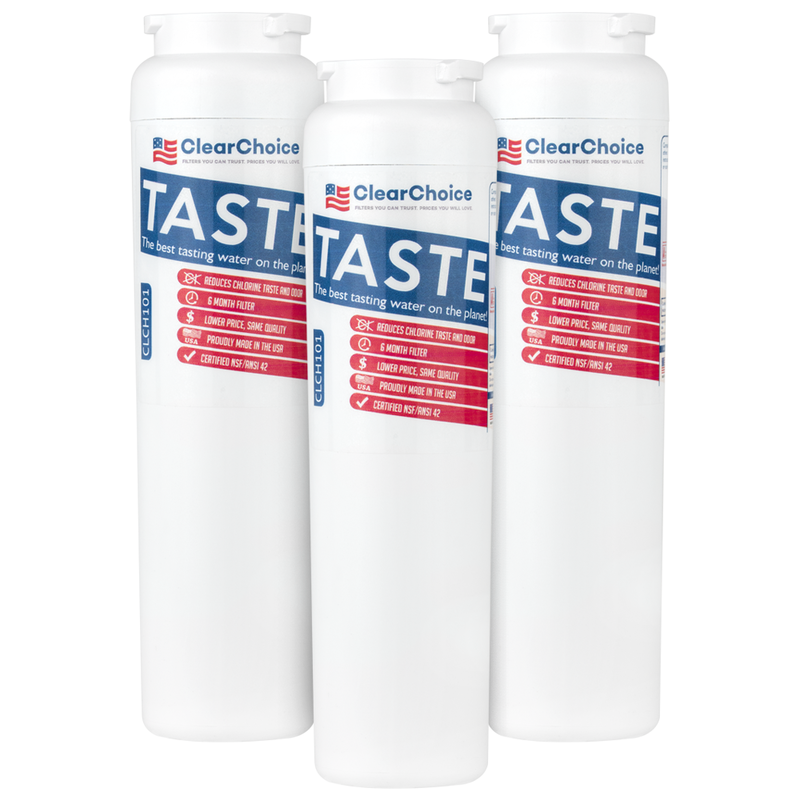 However, we still recommend the aftermarket ClearChoice replacement filter due to its affordable price and comparable filtration to the OEM. As always, enjoy 100% free shipping and returns on all of our discount fridge filters and air filters. Seems a great replacement for the $48 filter in the stores. 3 filters for the price of one and a half in the store. No Brainer. This is our second set and we were so happy with the first set that we bought another set. Shipping was quick. Installation was exactly the same as the filters that are three times the price. Water tastes great. I have found these filters to be equivalent in every way and am very happy with my purchase. We are on a city well with heavy limescale so we go through filters at a speedy clip. Love to save a few bucks!